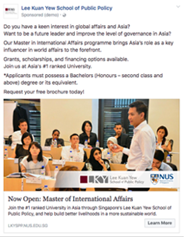 Established in 2004, National University of Singapore’s Lee Kuan Yew (LKY) School of Public Policy is Asia’s leading school of public policy and the first to introduce a fully integrated multidisciplinary curriculum. The school boasts a distinguished faculty active in research and a diverse student body of 400 students from 50 countries. A key component of the LKY School’s vision is to transform the world through good governance and leadership excellence. 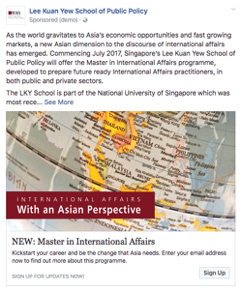 Every year, one of the key tasks that the External Affairs & Marketing team (LKY School) does is to attract student applications from various regions. Student recruitment is a year-long process which starts with lead generation in selected countries across the world. In the past, the team within LKY School would attract leads through promotional activities, such as face- to-face events, information sessions or post-graduate exhibitions. These tactics required heavy investments in time and money, due to the extensive travel needed. It was also difficult to scale up their marketing efforts and expand our reach to a wider audience. Before Brew Interactive, the External Affairs & Marketing team started a trial campaign in 2015 to attract leads by running Facebook ads. A total of 1,380 leads were generated at a high cost-per-lead of approximately $80. Post-campaign analysis has led them to believe that the campaign results and ROI can be further improved. That was when Brew Interactive was brought on. When Brew Interactive was engaged in 2016, the agency focused on a two-pronged approach. Pushing out engaging content using the Contagious Content framework. Comparative tests on images used. 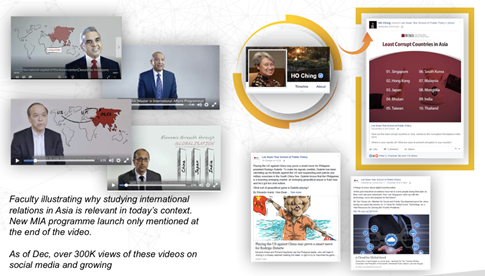 Together with Brew Interactive’s powerful media buying strategies and Contagious Content framework, the LKY School saw a significant impact on its digital presences. 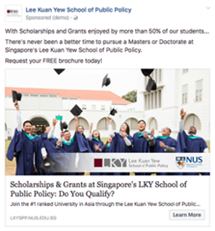 The LKY School now boasts a community base of over 400,000 fans on Facebook (grown from 30,000 fans), making it one of the most widely followed higher education institutes in Singapore. But it wasn’t just smart media buying that got the LKY School this far. 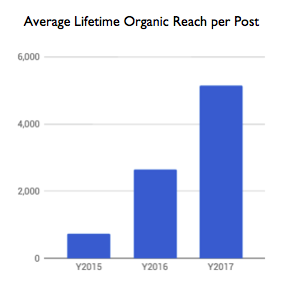 Engagement rate and Organic Reach of every post on social media has significantly increased over the years as well. And on the lead acquisition side for student enrollments, Brew Interactive has significantly stretched every dollar in the ad budget, generating more leads for student enrollment with a lower cost per lead acquisition. “We first started working with Brew Interactive a few times on some smaller projects and we were convinced by their great detail to producing results with the lowest costs possible. Not many agencies offered this as during the booming of the social media scene, many agencies were focused on producing “pretty graphics” or measuring success by the number of likes. Brew Interactive was able to look past this vanity measurement and produce real results for us. When we started our retainer contract, we were able to lower costs by going directly to the social media platforms that were most effective. The impressive thing was that we did this even before we set any benchmarks – this was due to Brew Interactive’s extensive knowledge of running objectives on the various platforms. On top of that, I’d like to specially mention two colleagues from Brew Interactive who have been great. Marvin’s great attention to optimising ads was welcoming. He’s the first growth hacker that I know that optimises by the hour! Also, his suggestions and advices were very strategic. Also, the account manager’s attention to our needs was such that by the end of the bedding in period, we had a well oiled machine. Brew Interactive knew what we wanted – leads + thought leadership and they also knew our expectations of creatives. Agency chemistry was also good.